A Landsat-derived map of Mississippi River Delta land area change. Red represents land lost between 2004 and 2005. Credit: John A. Barras, USGS. 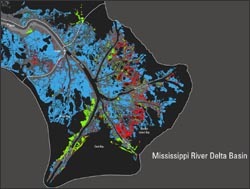 Oct 3, 2006 • A new peer-reviewed analysis of land change data from the U.S. Geological Survey’s National Wetlands Research Center indicates that 217 square miles of Louisiana’s coastal lands were transformed to water after Hurricanes Katrina and Rita.